Pure Hard Surface disinfectant is a new, EPA-registered food contact surface sanitizer and disinfectant. Powered by the patented, non-toxic, environmentally friendly SDC antimicrobial molecule, the spray rapidly eliminates bacteria, viruses and fungi, including multiple drug resistant organisms (CRE, MRSA, VRE), Norovirus, Hepatitis B and C, Listeria, E. coli, and Salmonella. With kills times as fast as 30 seconds plus 24-hour protection, it delivers broad spectrum power to eliminate dangerous pathogens in a wide range of food service environments. Full ceramic bearings can overcome the challenges faced by companies involved in water processing, water filtration and liquid handling. Full ceramic bearings have a much longer lifespan than hybrid ceramic bearings or steel alternatives, particularly when they aren’t placed under a considerable load. The main limitation of ceramic bearings is they can be brittle. Consequently, you must analyze the load to ensure the chosen material can cope with the stress. Full ceramic bearings perform better than any alternatives when placed in water and other liquids, the vendor claims. Depending upon the material used, the lifespan can be up to 70 times longer than stainless steel bearings. The company’s high-speed tray denester separates trays, clamshells, flanged lids, tubs and buckets from a nested stack and accurately places them, ready for filling, on a flighted or flat-belt conveyor at speeds up to 300 per minute. Featuring a single-sided cantilevered design, four-axis stepper motor system and full washdown capability, this cost-effective screw denester offers easy installation, five-minute changeovers and superior sanitation. According to the company, it is suitable for a wide range of trays for products that include foods such as bakery products, ready-meals, meat, poultry, seafood and fresh produce as well as cosmetics, pharmaceuticals, medical devices and other products. It handles square, rectangular oval, round and pie-shaped trays, clamshells, lids, tubs and buckets made of plastic, polystyrene, paperboard and molded-fiber. Accurately weigh 0.5-50g portions at up to 120 per minute using the company’s Ishida Micro multihead weigher. Taking 25 percent of the space of a standard multihead weigher, the product dispersion table uses a sensitive weighing sensor to assure precise automatic feeding of tea, herbs, spices, tablets, capsules, dried vegetables and other lightweight products. The weigher’s 14 weigh heads accurately measure weights in 0.01g increments to deliver target package weights as low as half a gram. Production data can be transferred via a USB memory stick, Ethernet or SCADA connection. Marshfield Food Safety recently opened a lab for food testing in Springdale, Ark., specializing in process evaluation especially for (but not limited to) the poultry category. A client needing a solution for testing resulted in Marshfield placing a lab onsite. The Springdale lab employs six people but hopes to expand microbial and pathogen testing to other clients in that area in the near future. Marshfield Food Safety performs about 1 million pathogen and microbiological tests at 12 labs across the U.S. and Canada. The DynaClean Vertical Z Conveyor is a solution for food processing facilities that have a need to move product to higher elevations. The patented line of conveyor systems are designed for ease of cleaning and sanitizing, which result in shorter downtimes and the ability to quickly return the conveyor to the processing line. The conveyor is custom designed to desired heights and includes widths up to 24 inches. A variety of belt styles, including solid-surface ThermoDrive and plastic link style belting, are compatible with the conveyor. Drive flight options include standard, 75-degree and scoop flights and are selected based on product and desired throughput. The conveyors will accept product from a vibratory feeder or the company offers the option for stand-alone or attached hoppers for bulk product feeding. The sanitary Tubular Cable Conveyor for fragile bulk foods and non-foods, allows rapid wash down of the system between production runs. The sanitary conveyor moves bulk material using high-strength, one-piece polymer discs affixed to polymer-coated 304 or 316 stainless steel cable, that slide within smooth stainless steel tubing, moving fragile products gently, quietly and dust-free. The discs evacuate the conveyor tubing of material at the conclusion of a conveying cycle, virtually eliminating wasted product. Any material clinging to the cable and disc assembly can be continually removed during operation by the stiff bristles of a brush box or by a residual return chute equipped with a disc ramp that dislodges material and returns it to the product stream. BladeClean is suitable for any size or type of tank with agitator blades. Incorporating this device into the tank cleaning process will reduce time spent cleaning and water usage, boosting overall tank productivity. Prior to cleaning, the BladeClean is inserted into the bottom of the tank and is activated at 2 bar (30 psi) and higher, causing a cone of water jets up to 7.6 m (25 ft.) to spray upward at the underside of the tank agitator blades. Reaching up to 4.5 kg (10 lbs.) of force, the water jets clean the agitator blades of product residue. Automatically entrain dry bulk ingredients into a motive liquid stream to convey pre-blended slurries, into a mix tank, blender or other process equipment with the Solidquid powder and liquid delivery system. In addition to dramatically reducing mix times, the unit instantly creates a non-viscous mixture, which provides downstream processing efficiencies, reduces energy costs, creates less dust, and uses less floor space when compare to other pre-mixing options. The Solidquid operation creates a high-velocity jet that pulls dry material through the wetting cone. The process liquid supplied to the eductor inlet creates a vacuum, pulling the dry ingredients into suspension dispersing particles evenly into the liquid flow. 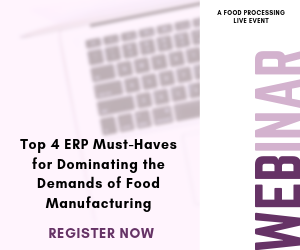 This technology serves a wide range of applications across food processing, offering advantages in both R&D and production runs. Meat, poultry and seafood currently packed with water ice or dry ice in boxes can be chilled more safely and efficiently when using the Dri Pack automated box chilling system, which uses the chilling power of carbon dioxide (CO2) snow. Designed and built to USDA requirements, the chilling system is said to be ideal for meat packing plants as well as poultry and seafood operations, and is intended for use with new or existing packaging operations. The automated chilling system quickly fills boxes (up to about 24 inches wide) with CO2 snow as they travel along a conveyor. High-performance synthetic base stock Elevance Aria WTP 40 has been certified as HX-1 food-grade, expanding the lubricant's current industrial applications to include food processing and other applications requiring HX-1 certification. This high-viscosity, base stock co-polymer has generally recognized as safe status from the FDA. It combines the composition and properties of esters and PAO into a single product that improves seal compatibility, wear resistance and cleanliness due to the superior additive solubility and lower foam across a range of temperatures when compared to traditional PAO-based formulations.